Website Design & Development by ASTRALCOM Integrated Media Services | ASTRALCOM - Content Strategy, Conversion Marketing and Customer Acquisition. Gehan Homes – Website Design & Development | ASTRALCOM – Content Strategy, Conversion Marketing and Customer Acquisition. Flow like a real estate site; present like a museum. 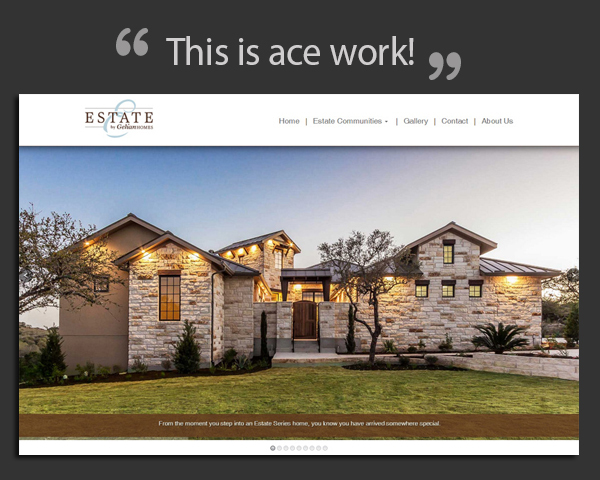 That was the objective for the Estate by Gehan Homes website design and customer experience. Because Estate by Gehan Homes is dedicated to designing and building highly-customizable, luxury residences in carefully selected communities, it was critical to develop a site that helped to effectively convey the essence of these beautiful homes. Gehan Homes’ staff can maintain the site’s content easily because we did some very cool things with data syndication and display that allowed them to continue to utilize their existing main content management system. That helped save time and money. Of course the website is responsive and mobile-friendly, since the majority of the target audience will be accessing the website from their mobile devices and tablets.